Arne Raven was born on a farm in Frørup, Denmark on October 15th, 1930. He grew up with a love for the land and farming that remained with him all his life. He left Denmark at 19 and immigrated to Canada. In 1950, he became a Canadian citizen, and was a proud Canadian until the day he died. It was here at St. George’s Ranch that he started his cow-calf herd, while running a mixed farm with pigs, and dairy cattle as well as an apple orchard while supporting his children’s love of chickens, horses, and sundry rabbits, guinea pigs and the occasional goat (under duress!). In 1985, Arne brought his cow herd (and family) to Pritchard where he ran the Wolf Ranch for over 30 years. He enjoyed being able to bring his stewardship ethic of ranching in harmony with nature to create a well-managed and stewardship-award-winning ranching operation. The ranch was a place where everyone was welcome and hosted many barn dances, ranch tours, international summer students, university field days and small tours of his beloved alpine lilies every spring. Over the years Arne served as school trustee and Chairman of the School Board for School District 30, belonged to the B.C. Cattlemen’s Association, served on the Board for Kamloops Stock Association and the Pinantan-Pemberton Stock Association, the Kamloops Land Resource Management Plan, and served on many TNRD committees. Arne was a long-serving member of the Pritchard Community Association, helping to bring a community hall and many dances to Pritchard. Arne enjoyed the many years playing Santa for the Pritchard children. 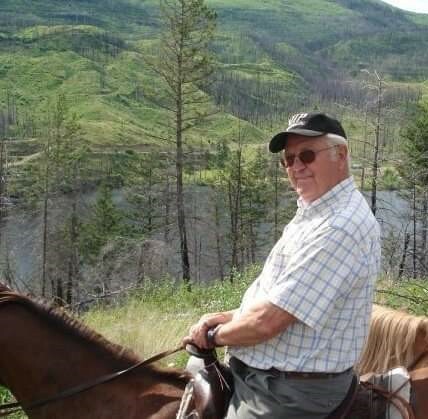 He was also a very proud member of the Chase Rotary, the Kamloops Naturalists Club, Kamloops Adult Learners and supporter of the Kamloops Symphony. Arne passed away peacefully on March 4th, on his own terms, surrounded by his loving family and following several days of wonderful get-togethers with very dear friends. He was adamant he wanted a party not a funeral. Therefore, we will be having a Celebration of Arne’s remarkable life at Chase Community Hall on March 23rd, at 4pm. We will start off with stories about Arne, then eat a dinner of his favorites, followed by dancing and enjoying the live music of Ritchie and the Fendermen. I am so sad to hear about Arne’s passing – I find myself somewhat speechless ! I had the most wonderful drive with Arne out to Lillooet and back when your mum passed. I will always treasure that day as we shared some great memories and learnt a few new things about each other – it was a great day spent in good company. My thoughts of course turn to the two of you and Tove, who I know has great admiration of her grandfather, and many memories to carry with her. I only met your father once about a year ago. He was a man who connected to people and obviously liked people and sharing his love of the land. Something about him touched my soul. I think you were very blessed to have him as your dad. Christian and I are sad to hear of Arnie’s passing. We had so many fine times horseback riding and ATVing at the Wolf Ranch, not to mention the yearly barn dances, brandings, and the many lunches and dinners together. He was always jovial and enthusiastic about life. We enjoyed his company and have many good memories. I am so sorry to see that our beloved Arne and Dad has passed. Love and hugs Karen and Sonya. I loved his huge personalty and dedication to you two and I imagine to his grandaughter as well. I regret these last few years not being a part of your lives. You have all been on my mind for the last couple of weeks and now I understand why. I will see you on Saturday. Love you. and riding, chasing some of his cattle. My thoughts with you both, Karen and Sonja. Dear Karen, Sonja and Tove, our deepest sympathy over the loss of your Father and Grandfather, Arne. He was a good man and loved you dearly. He contributed to the life of our Unitarian-Universalist Fellowship of Kamloops. With many blessings to you all. You are in our thoughts at this time. Sorry to hear of your Dad’s recent passing. He was an an amazingly strong, generous and thoughtful man. Sorry I missed you at his party in Chase. Had just returned from Canmore late Friday with a bad case of bronchitis. Hello Karen and Sonja . . . someone said ‘a well lived life leaves beautiful gifts shining on the shore’. Your father left many gifts. Arne and I became friends 10-15 years ago. We shared many interesting conversations and a few adventures. I was an ear for listening when things were troubled. He will be very much missed. I have a few photos you might like. Send me an e-mail and I’ll get them to you. I was deeply saddened to learn of Arne’s passing. My dearest Condolence. I had the pleasure of working together with Arne at the wolf Ranch Back in the 80’s and then having an after noon together with him during a road trip through the Okanagan Valley in 2012. An Oscar and a gentleman , only amazing memories.